Am I addressing any fans of comedy of the absurd? 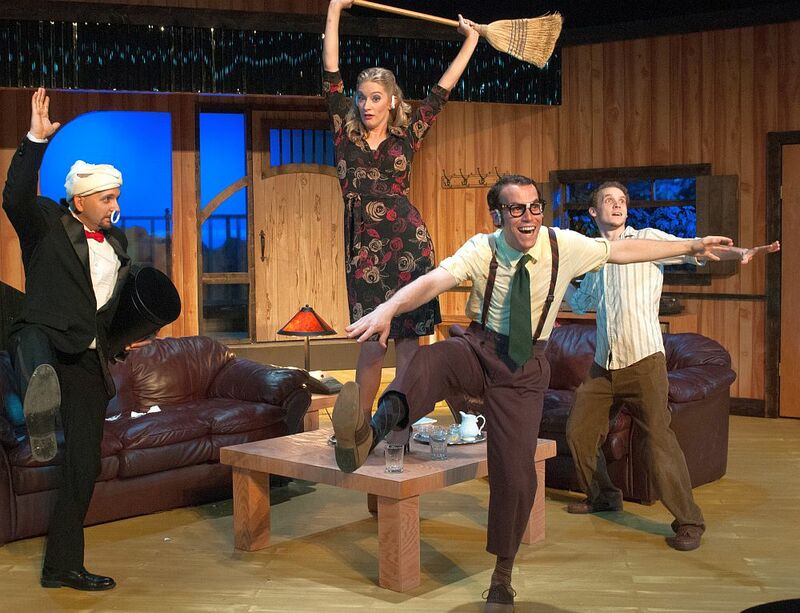 If so, here are a few notes on Texas Repertory Theatre’s current production of the late Larry Shue’s very nutty play, The Nerd. 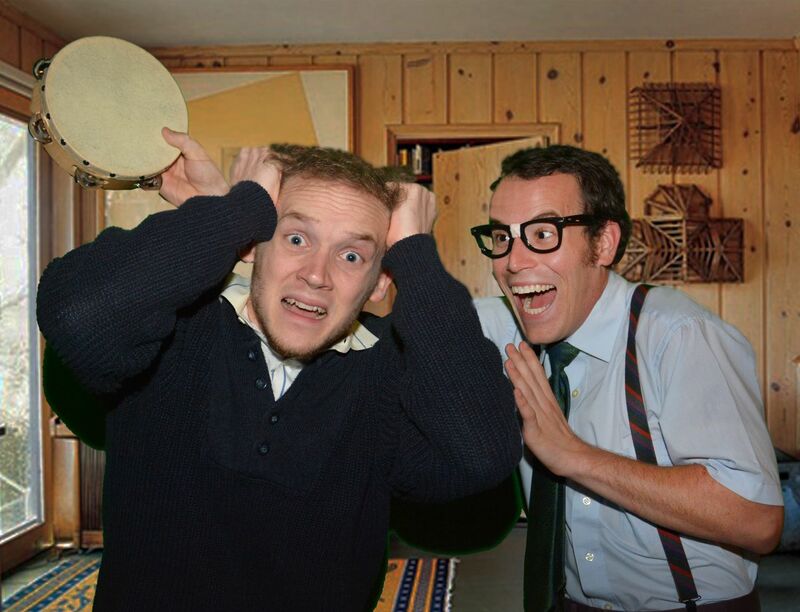 Directed by Steven Fenley and starring wild man, James Monaghan in the title role as Rick Steadman (the nerd), this show has a unique construction because the central character is designed to be endlessly annoying. That can be pretty tough on an audience at times, but if you have an offbeat sense of humor you may join the many in the audience that find plenty of laughs. The action takes place in the neatly modern home (set designer, Trey Otis) of architect, Willum Cubbert (Mike Sims). It is Willum’s birthday and his good friends, Tansy (pretty Lauren Dolk), and droll Axel (David Walker) have planned a little surprise celebration at Willum’s home. The insanity gets under way when one of Willum’s clients, high-strung hotelier, Warnock (Jeff Lane) arrives with his obnoxious young son, Thor (Estus Cretsinger), and his edgy wife, Clelia, who is clearly a candidate for anger management classes. Now it happens that many years earlier Willum had nearly died when wounded as a soldier in Vietnam. A fellow soldier, the aforementioned Rick Steadman, had carried the unconscious soldier to safety, but by the time he recovered Willum never had the opportunity to meet his rescuer. Back home he corresponded with Rick explaining his gratitude, and how if Rick ever needed assistance of any kind he would be ready to help. What a surprise when Rick shows up for a surprise visit during the party. The hook is that Rick turns out to be a completely obnoxious idiot who literally moves in while Willum tries to figure out how to graciously get rid of this man who saved his life. The plot has an interesting and unexpected twist at the end, but meanwhile don’t be surprised if you find yourself wanting to strangle this moron yourself. THE NERD continues through September 22nd at Texas Repertory Theatre in the Northwoods Plaza at 14243 Stuebner Airline Rd., Houston, Texas. Remaining performances will be tonight at 7:30 pm, Friday & Saturday at 8 pm, and Sunday at 3 pm. For tickets and information call 281-583-7573 or visit the website at www.TexasRepTheatre.org. This entry was posted in Houston Community Newspapers online, Larry Shue, Texas Repertory Theatre, The Courier Columns, The Nerd, Theater Reviews, ThePeoplesCritic.com, YourHoustonNews.com and tagged comedy, plays, Reviews. Bookmark the permalink.